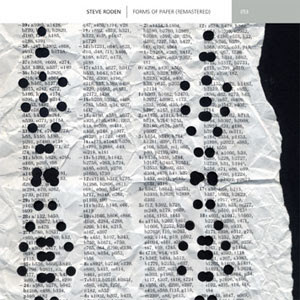 10 years ago i released a CD on line called "forms of paper". it was the first composition i had ever created in collaboration with a computer. the piece was originally created as an installation - built from the sounds of handling book pages. the original 8 channel installation was then mixed to stereo for CD release. now, on the 10 year anniversary of its initial release, line has invited me to release bernhard's re-master of forms of paper as a high quality download, and i am quite excited to finally have the piece go out into the world wearing its fancy clothes! along with the release of the remastered music, i have written a nice long text on the history of the piece, as well as its relationship to the beginnings of the lowercase scene - all of which was were beautiful designed into a pdf by line's head honcho, richard chartier. take a peek here for details! at 7pm at the hamburger bahhof in berlin on october 28th (this friday) will be a celebration of artist rolf julius, who passed away earlier this year. 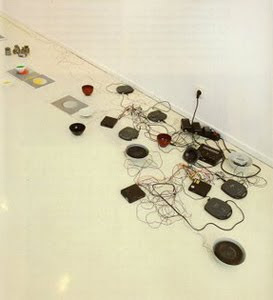 peter ablinger, arnold dreyblatt, fast forward, felix hess, christina kubisch, hans peter kuhn & junko wada, bernhard leitner, david moss, rie nakajima, robin minard, michael moser, steve roden, akio suzuki, miki yui. some of the participants will be performing (myself included) while others will be playing recordings and/or videos. i'm going to be in berlin for the next 4 weeks. 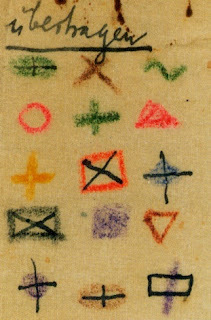 much of my time will be spent looking at walter benjamin's notebooks and notes, exploring mostly symbols, incidental marks, visual systems, etc. towards a new body of work. the blog will either be quite active, or a bit asleep. 8pm, speaker: Caltech astronomer Mike Brown, author of "How I Killed Pluto and Why It Had It Coming." followed by a reception. i will be showing a new 2 channel soundpiece entitled: rain static in hanover, which was created using 1955 LP containing ionosphere recordings and contemporary recordings of sunspots. The Brick + Mortar festival takes place in Greenfield, an historic mill town in western Massachusetts. Transforming the city’s downtown into a temporary arts district, the festival presents video projections and installations within a variety of extraordinary architectural sites that are in various stages of renovation. Presented by ConjunctionArts in partnership with local businesses, the Franklin County Chamber of Commerce, the Greenfield Business Association, Greenfield Community College, and Five Colleges Inc., the festival is free and open to the public. i will be showing my film 'striations', shot on 16mm with mary simpson, and recently shown at the sculpture center. PLEASE NOTE I WILL NOT BE PRESENT AT EITHER EVENT. information on the performers, etc. below, and all events are FREE! IGNITE/FLOW, curated for AxS FIRE and WATER by visual/sound artist Steve Roden, features three commissioned works by four remarkable interdisciplinary artists: Mark So, Yann Novak and Robert Crouch, and Carole Kim. The commissioned artists were asked to respond to the FIRE and WATER theme as well as the Wind Tunnel Gallery site on the Art Center College South Campus (home of the Graduate Media Design program). Composer Mark So presents READING ILLUMINATIONS [readings 41], a sonic exploration of fire and water elements in visionary post-romantic poet Arthur Rimbaud’s dizzying collection of prose poems, performed both nights by Mark So with Julia Holter. Mutii-media performance artists Yann Novak and Robert Crouch present FATA MORGANA – a kind of fragmented travelogue, reconstructed through video and audio field recordings using sound and multi-screen projection surfaces.The performance mirrors the rare and complex Fata Morgana mirage phenomenon which hauntingly inverts the boundaries of figure and ground over both desert lands and seas. Carole Kim presents SCAN, a highly textured work incorporating live performers, real-time cameras, feedback loops, soundscapes, original music scores and computer-controlled projections on a multi-planar 3D cloud-like structure that will break down the projected image into particulate fragments. This hybrid space folds the actual into illusory – producing an ephemeral environment designed to crack open our normal perceptions of spaces and containments . . . including the human body. Free - but reservations are highly recommended! 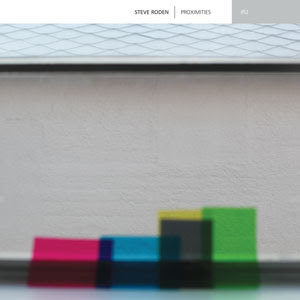 Proximities was recorded in 2010 during my time as the artist-in-residence at the Chinati Foundation in Marfa, Texas. I began by recording a performance of a series of tones played on an old battery powered Paia Oz synthesizer with a built in speaker, determined by the letters A-G as found in a text by minimalist sculptor Donald Judd. I recorded the tone sequence several times during sunrise, amidst 50 of Judd’s stainless steel sculpture in an old army barracks that has been converted into a museum. The performances were recorded with an H4 digital recorder, my iPhone and also a cheap Sony micro-cassette recorder. The space was one of the most resonant i have ever been inside of. During each successive performance/recording these small recorders were emitting the sounds of previous performances through their tiny speakers. At times I also hummed. Obviously the process owes much to Alvin Lucier's seminal work "I Am Sitting In A Room." Essentially, the piece is an accumulation of field recordings, and not only is the space itself audible, but also passing cars, etc. All of the processing in the recordings was "acoustically" generated by simply playing the sound in an extremely resonant and uniquely sounding space. The occasional popping sound, many of which can be heard at the end of the piece, are the sounds of Judd’s sculpture expanding while the sunrise begins to change the temperature within the space. the cover image is from a failed film project/experiment, also created at chinati, using the same vowel structure as i used to generate the music to determine arrangements of colored gels. the cd is available directly from the label, or from the usual outlets. you can also hear excerpts on the line site and see images taken during the recording process.